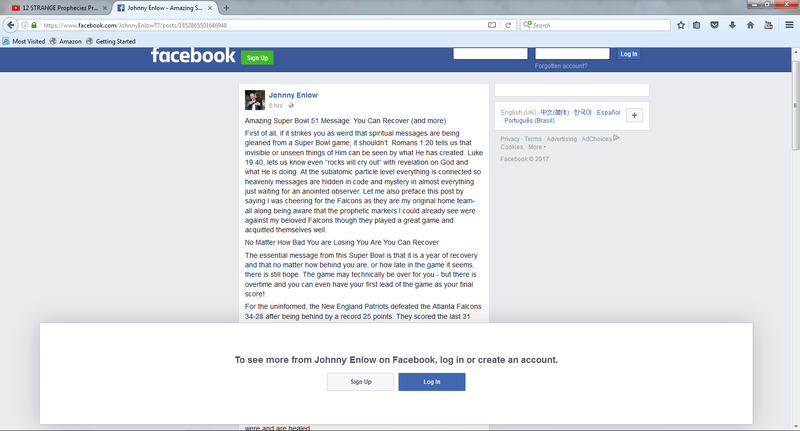 NAR Apostle Johnny Enlow’s whacky ‘prophetic’ Super Bowl ramblings. Home › New Apostolic Reformation (NAR) › NAR Apostle Johnny Enlow’s whacky ‘prophetic’ Super Bowl ramblings. Apostle Johnny Enlow, a major promoter of the NAR (New Apostolic Reformation) Seven Mountain Mandate, believes he received a ‘prophetic’ message from the latest Super Bowl game. First of all, if it strikes you as weird that spiritual messages are being gleaned from a Super Bowl game, it shouldn’t. Romans 1:20 tells us that invisible or unseen things of Him can be seen by what He has created. Luke 19:40, lets us know even “rocks will cry out” with revelation on God and what He is doing. At the subatomic particle level everything is connected so heavenly messages are hidden in code and mystery in almost everything just waiting for an anointed observer. Let me also preface this post by saying I was cheering for the Falcons as they are my original home team- all along being aware that the prophetic markers I could already see were against my beloved Falcons though they played a great game and acquitted themselves well. The essential message from this Super Bowl is that it is a year of recovery and that no matter how behind you are, or how late in the game it seems, there is still hope. The game may technically be over for you – but there is overtime and you can even have your first lead of the game as your final score! For the uninformed, the New England Patriots defeated the Atlanta Falcons 34-28 after being behind by a record 25 points. They scored the last 31 points in the game to win in overtime. This was the first Super Bowl ever to go into overtime. Tom Brady was the MVP (most valuable player) of the game and came back from being hit and sacked multiple times. His tenacity and resolve was just so key. Meaningful numbers are all over the place with Brady. He is 39 years old making it the second consecutive year that a 39 year old QB wins the Super Bowl. Last year it was Peyton Manning and I noted that it tied in with the 39 stripes Jesus took and that a great healing is coming to our nation (as counterintuitive as that can seem for some). By His stripes we were and are healed. Brady is also a #12 and that is the number of government. Tom took a lot of heat for being a supporter of Trump believing he could help our country be better and stronger. Tom Brady was born in ’77 which gives us that reoccurring number. We are in the Hebraic year 5777. Trump had 77 more electoral votes than Clinton. Trump was 70 years old, 7months and 7 days old when he was inaugurated as President. Furthermore this was Brady’s 7th Super Bowl total and was his 5th victory overall. 5 is the number of grace and 7 is the number of completion but also the most symbolic number of God Himself. The Bible tells us there are 7 spirits of God. We are in a year of very intentional and strategic grace from God Himself. Tom’s first name means “twin”. Part of this means he is mirroring that which Donald Trump is doing in government. As you remember Trump, he looked way behind in the “score” on Election Day and it wasn’t until “overtime” that they announced he had won. The other part of “twin” speaks of the double blessing or anointing. I and others have observed that President Trump has been given a Is. 45 Cyrus mandate to reform and to prosper. That chapter starts out with how God would open before him the “double gates” or “double doors”. The name Brady means “spirited” and as a secondary definition “broad- eyed”. This too describes our president but it is to describe those of us who will see our own personal recovery. We must be “spirited” and have our vision expanded to see what God is doing both in the micro and in the macro. There was also a recurring theme of family at the Super Bowl, with even Lady Gaga pointing out her mom and dad, and Brady coming up with his whole Brady clan. I am reminded of the popular Brady Bunch television series of a large non-traditional family. This certainly describes America as well at this time- and it is time for the American family to win, win, win. I believe that unexpectedly a great valuing of family is coming as a great angel assigned to this has been released over us. The Patriots won the Super Bowl and the theme of Patriotism was throughout the Super Bowl. Lady Gaga initiated her halftime show with singing of the American anthems. The colors red, white and blue are the color of the Patriots and were also throughout. Now is a time for us to be Patriotic. Now I know it is popular to say we are not called to be for our own nation but instead for “the kingdom”, and that has some basic sounding truth. However, Jer. 29:7 also says to seek the wellbeing of where God places us because in ITS wellbeing WE will have wellbeing. We can sometimes be so spiritual that we miss the reality that He put us in specific physical bodies, families, cities and nations and that are spiritual kingdom call will always overlap caring for the physical. If your marriage is important, if your family is important- then your city or nation is important as well. Jesus wept over His Jerusalem – and He is still not done caring for that original physical Jerusalem. It is also part of the prophetic message of this Super Bowl that the Patriots owner Bob Kraft is a Jew and also a friend of Donald Trump. The recurring theme of patriotism and care for Israel will be with us for the foreseeable future as something God desires us to pick up on. Last year’s Super Bowl was played in Levi Stadium and there was a message I shared on that. This year it was played in Houston’s NRG (pronounced and intended as Energy). There is a spiritual message here as well. As we fall in line with God’s heart and agenda at this time He will connect us to new levels of His Energy or Dunamis power. Power to recover and power to win. It is of interest that the Patriots had 93 plays and the Falcons only 46, and that the time of possession in favor of the Patriots was 40 minutes to 23 minutes. In essence they just kept coming and coming. The Falcons were more efficient on their plays and had more yards per play- but the Patriots just insisted on staying in possession and attacking. They in effect wore down the opposition. This is a word for you, for me, for us. Keep getting the ball back, keep playing, keep the enemy on the defensive- because even if it takes all game and more- you are going to come out ahead. Greater is He that is in us than he that is on the other side- even if it doesn’t look like it for a long time. And finally all the above recovery takes place as we operate out of the truth of Psalms 34: 2-8. I will highlight some aspects of this passage but it is oh so worth it to go dive into it in a deeper way. It is just loaded with relevant truth for those ready to win in 2017.
v.2. My soul will boast in the Lord, let the afflicted hear and rejoice. v.3,4. Magnify the Lord with me (as opposed to your challenges) and He delivers from ALL my fears. v.5. Those who look at Him are radiant. v.7. The angel of the Lord delivers those who trust Him. v.8. Taste and see that the Lord is good. So in a nutshell here is your Super Bowl message. 2017 is a year orchestrated by God for you to have amazing recoveries from amazing contradictions. It is a year where He will also greatly use the man He put in as President. You don’t have to love him or everything he does- but there is wisdom in respecting and honoring who God puts in. God wants His people thinking patriotically towards America because there is a specific lead nation call that is on us. The other nations are held back in some capacity until we step into ours. It is why you will hear the prophetic people from other nations keep telling us of the great things God has for America. They know by the spirit that as we prosper, overcome darkness etc. that it has a ripple effect into their nations. It is because of the call on our nation, and it is because He loves ALL nations. And finally, read my last book Seven Mountain Renaissance: Vision and Strategy through 2050 for more on how this all fleshes out. We have just begun our age of recovery. ‹ Furtick & Noble – the unqualified restoring the unqualified.